Have switched your phone to the most powerful Android flagship Samsung Galaxy S8? How about your personal data? When got a new phone, one of the most annoying thing is how to transfer old phone data to the new device with ease, especially some important app data. Currently, due to improved security settings on apps and systems, it seems that transferring app data from one phone to another is more and more difficult. However, some messaging apps, like WhatsApp, Wechat, the chat history can be important to us, and we need the conversions to be transferred over when switched to a new phone. And this article will give you two great options to help you transfer Wechat history. Wechat, one of the most popular instant messsaging app worldwide, developed by the famous Chinese technical company Tencent, are available for all kinds of phone operating systems, and now it becomes more than a messaging app, supports multiple people voice and video call simultaneously, transferring money, paying, public city services, etc. If you are using this powerful app, you might know that due to security settings, your account is only allowed to be logged in on one device at the same time, and all Wechat conversations are saved on the internal memory of old device. So when login your Wechat account on your new device, you will lose all your conversations. Hence, you need to transfer the Wechat history to your new device. Method 1. 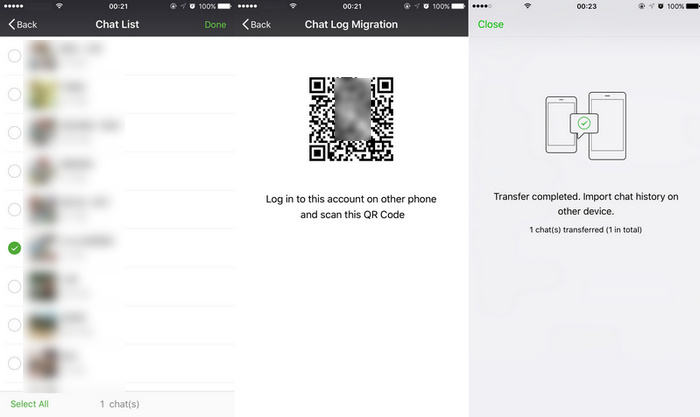 Transfer WeChat history via built-in Chat Log Migration tool. Method 2. Transfer WeChat history with Wechat for PC. What we need: The old phone, the new Samsung Galaxy S8/Plus, WiFi network. Step 1. Connect both phones to the same WiFi network. Open Wechat app on your old phone, login your Wechat account if you haven't. 1. For Android device, tap Me > Settings > Chat > Chat Log Migration. 2. 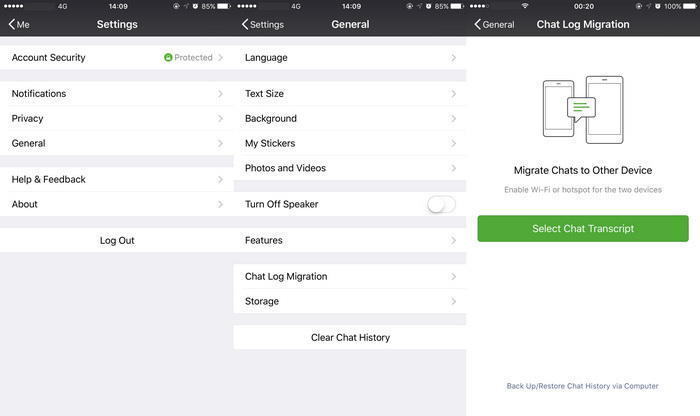 For iOS device, tap Me > Settings > General > Chat Log Migration. Then you will be asked to select your desired conversations to be transferred over. And a QR code would be generated automatically after you finished the steps. Step 2. At this time, login your Wechat account on your Samsung Galaxy S8, tap "+" and select Scan QR Code on the right top of the screen. Simply scan the QR code generated on the old phone screen. And all your select conversations would start to be transferred, and after a while, all conversations would be copied successfully. Step 1. Download and install the latest version of Wechat for PC on your computer, then launch it. Step 2. It will ask you to use Wechat app to scan the QR code to login your account on computer, tap "+" and select Scan QR Code on your old phone to scan the QR code on computer. Step 3. 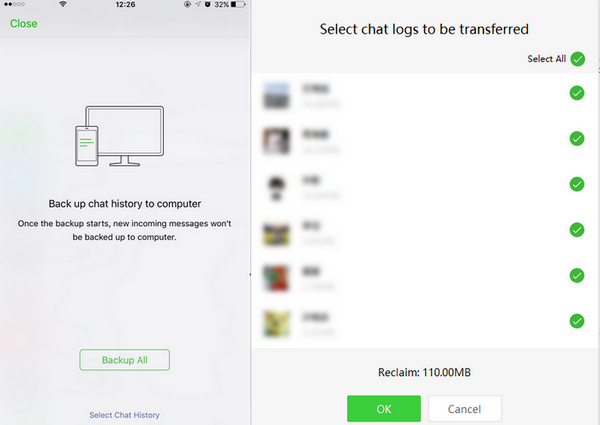 To backup your Wechat history to computer, you need to connect your phones to the same network (WiFi) with your computer, click on More button on the left bottom of the panel, hit Backup and Restore, then select Back up on PC module on the pop-up window. Step 4. Then it will ask you confirm the backup process on your phone, so navigate to your old phone screen, tap Backup All or Select Chat History. After that, back to your computer desktop to start backing up your Wechat history. And Wechat for PC would start backing up your Wechat history on PC, after a while, all your selected chat history will be backed up successfully. Step 5. Now, login your Wechat account on your Samsung Galaxy S8, to restore the chat history to S8, we need to select Restore on phone module this time, similarly, you need to confirm it on your Samsung Galaxy S8 screen, before long all Wechat history would be restored to your Samsung Galaxy S8. Tips: You can change the backup path on your computer by clicking on More > Settings, on the pop-up window, you are allowed to change some system settings including the Wechat history backup path.